Julie Leddington is the proprietor of Flowers of Hagley and she has been involved in the industry from the age of 12! “Flowers have been a passion for me ever since I started work at Fiona Florists, Halesowen, as a 12 year old “Saturday Girl”. Upon leaving school at the age of 15 in May 1977 I went to work at Fiona’s on a full time basis learning my trade in the shop, eventually becoming the shop manageress. I continued to run the shop until I had my first child in 1992 deciding to be at home for both my first and second child who was born in 1996. Eventually during their early school years I got back into the floristry business, all be it on a part time basis, at Hanbury Nurseries, Stourbridge - but I felt I needed to do more. In 2001 I started my own successful Wedding Flower Business, “Flowers by Julie”, which not only again invigorated my passion for flowers but also enabled me to mix my family life with the business as I worked from home in a work shop in the garden. As Flowers by Julie continued to grow there was always the dream of getting back to running a florist shop, my Shop, and this feeling was enhanced whilst helping out in a shop in Oldswinford over the 2014 Christmas period. We had looked at a couple of retail shops in the village of Hagley but for one reason or another they were not available or not suitable. Then, just by chance, we were told number 137 Worcester Road was available. This was a shop we had often walked by and said that it would be an ideal florist shop for us as it had character, a good position and plenty of free parking around it. As soon as we stepped inside for our initial viewing we knew it was right and we submitted our deposit the next day. It has taken quite a few weeks for us to be in a position to open the shop and I’d like to thank our friends, family and suppliers for their assistance and support with this new exciting venture. 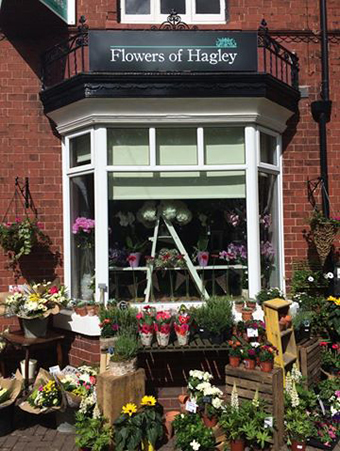 So here I am after 40 years in the floristry business living my dream by opening my own shop “Flowers of Hagley”. I will continue to run Flowers By Julie as part of the new shop as it has been wonderful over the years meeting with Brides, Grooms, Mom’s, Dad’s, etc., now they can come along to Hagley and meet me in the shop! Our policy is to offer our customers, “Value for money”, no additional charges going to other organisations, i.e., you get the appropriate value of flowers that you have paid for.